When a house is being repainted, it’s not enough to simply slap some paint over the old paint. Time and weather can erode the paints surface. To ensure a long lasting new coat, the entire surface to be painted must be professionally cleaned and prepped. How much work a professional painter puts into the preparation phase will affect the price. In addition to removing loose paint from a house, power washing is an efficient way to remove dust that may build up in the stucco texture of our Tucson homes. Done correctly, it thoroughly cleans the surface that is to be painted, allowing for a smoother, and more adhesive coat of new paint. Because the power washer doesn’t always get all the loose paint off a house, a Professional Painting Contractor will hand scrape or sand some areas to remove edges and bubbles of dried paint. Using a premium quality acrylic primer will increase the life span of the top coat of paint, it helps hold the paint film on the surface as intended, paint applied to bare wood will soak into the wood leaving less paint on the surface, in addition it give the paint something to adhere to. The prime coat can raise the cost of painting your Tucson home, but since it will extend the life of the paint job, and because many Paint Manufactures require it to honor their warranties, it’s certainly worth the investment. Many people think caulking is done for more cosmetic reasons than anything else. It’s true caulking cracks and joints does give the paint job a smooth and newer appearance. Caulking door frames and window with a premium quality caulk can help prevent moisture build up, and cool air loss during Tucson’s brutal summers. Over the years I’ve had to repaint a home within a few years of being painted because the previous painter did not follow these steps, and the homeowner was paying more attention to the cost than the scope of work. I hope this helps you to appreciate the value of having your Tucson home prepped correctly prior to paint. 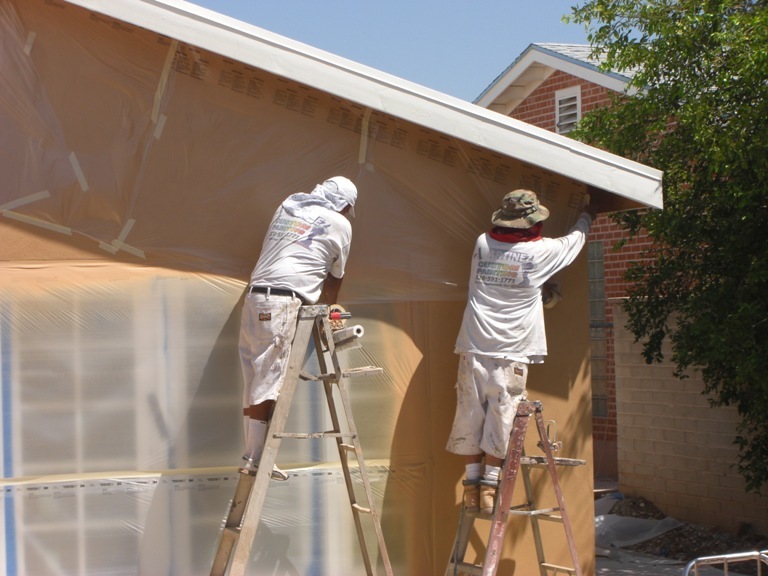 Making sure your Tucson Painting Contractor follows these basic steps will ensure the paint adheres properly, thus maximizing the lifespan of your paint job. In my next post I will share the importance of understanding the technique used to apply the paint to your home and the importance of using the right paint.